Concrete can pile up when you have no use for it. Let JUSTJUNK help answer the question of how to get rid of concrete with our concrete removal service! With our comprehensive rates, you simply pay for the space your concrete takes in our truck. It couldn’t be easier with our friendly service professionals. 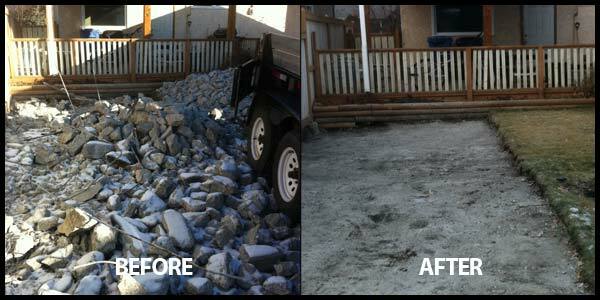 We remove, pickup and disposal of concrete, brick, stone or gravel in minutes! With our cement removal you only pay based on the volume of your concrete – it’s that simple. Our comprehensive rates are all inclusive and full service to ensure the lowest rates, especially compared to bins. No rental fees. No disposal fees. No work – our concrete pickup service means that you simply relax as we take care of the lifting and loading! Just sit back and watch as the cement disposal professionals from JUSTJUNK do all the heavy lifting, loading, and concrete recycling for you – all at no extra cost. Everything is included in order to make our concrete removal the quickest and most budget friendly concrete pickup service available, and with our convenient 2-hour arrival windows, time sensitivity is always a priority with JUSTJUNK! Scheduling your concrete pickup and removal is easy with JUSTJUNK! With our same day service, our fully trained and insured professionals can even be there as soon as today. Book online today! For more information, or to speak to one of our concrete disposal team members, call JUSTJUNK today at 1-888-586-5888. Concrete, as well as many other building and renovation materials, is able to be reused in many different ways. With JUSTJUNK, cement recycling comes with our environmentally friendly guarantee to work with local recycling facilities to ensure that as much as possible is reused. Many renovation materials can be reused and our brick recycling service makes it easy to avoid the dump.